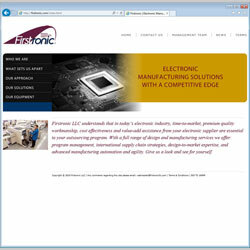 Project Scope: Offering electronic manufacturing solutions, Firstronic has an extensive track record of supporting customers with technically challenging products, aggressive ramp schedules and the need for a partner who can provide scalable support over the life the product. Although they have extensive experience serving a wide range of product applications, they tend to fall into five main categories: Automotive, Industrial, Medical, Commercial and Transportation. Design components: This was a site re-design. The old site was lacked both visual and content impact and the navigation was difficult at best and some of the important pages were buried and almost impossible to find. The new site is now cohesive, easy to navigate and find material is visually pleasing using images of their employees on location. 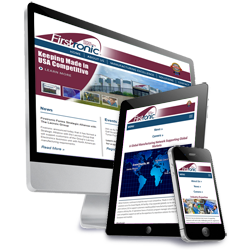 The site redesign also included a comprehensive review and rewrite of their existing content to ensure their message was fresh and up-to-date, which was done by their consultant Susan Mucha of Powell-Mucha Consulting. Responsive - Mobile Friendly: In 2016 we converted the original site to be fully responsive for all mobile devices. “ We have worked with Vortices Design multiple times over the past few years to continually upgrade the look and capabilities of our website. Each time we were very pleased with their work, including the rapid responsiveness, excellent service and very competitive pricing. In our industry, conveying a professional impression of high tech skills and global capabilities is extremely important. Vortices Designhas always developed new ways of differentiating our business that has helped us to stand out amongst our peers in a very competitive field. We highly recommend working David Maria and his team for any needs related to web design. We wouldn’t hesitate to use him again.